At first glance, the treatment therapies that use red and blue spectrum light to treat skin disorders and revive aging skin may seem a bit dubious. How can a light beaming on your face actually help change the visible attributes of your skin? Well, infrared red and blue light therapy, as more and more people are finding, are an excellent way to help treat acne and eczema and to rejuvenate and smooth the signs of aging. 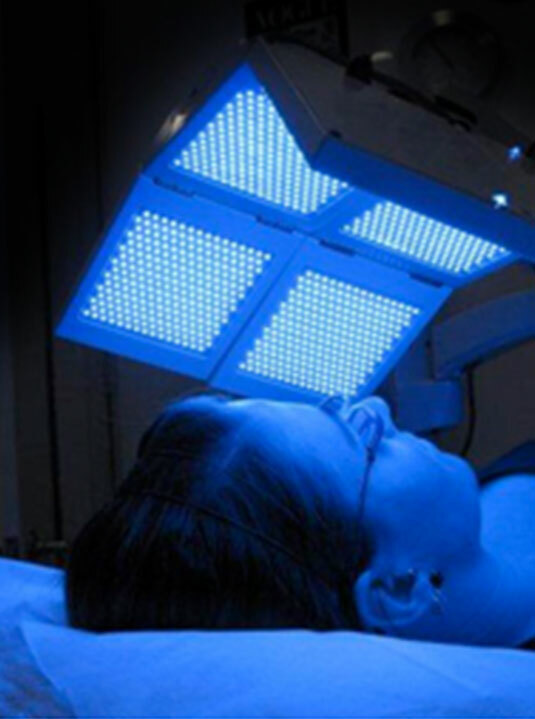 Blue light therapy works on acne inflicted skin by killing bacteria on the surface of the skin. How does killing bacteria help with acne? Well, bacteria are actually one of the major causes of acne. This, along with the excess sebum that acne prone skin produces, is what creates acne pustules or lesions on the skin. The excess sebum essentially traps the available bacteria on the skin, which causes an erupted infection on the surface of the skin. Basically, by taking bacteria out of the equation, blue light therapy helps those with acne by clearing the skin of these inflammation-promoting organisms. This type of therapy has been a very successful treatment method for many with the acne skin condition when combined with the proper cleansing and treatment regimens. It is considered very safe, and the best part about it is that you do not need to take any synthetic drugs. Blue light treatments are available in some spas, and also in some dermatologist’s offices. There are also in-home options that use blue spectrum light therapy as well. Depending on your budget and goals, this may be an option worth looking into if you have acne and are looking for alternatives to harsh drugs or antibiotics. Long term antibiotics can do more harm than good by throwing off your body’s natural probiotic balance. This can lead to digestion and elimination issues, amongst a host of other problems, so you can see why more and more people are searching for alternative acne treatments. There is also another color in the spectrum that can be extremely therapeutic for your skin. Infrared red light therapy is a little different than blue light, in that it is used in a different capacity. The primary function of red light therapy is that it is supposed to help accelerate wound healing, stimulate collagen production, and aid in fading sunspots and hyper pigmentation. This can actually be used in conjunction with blue light therapy for acne, since it helps accelerate wound healing by enhancing collagen production. This means that it can help to reduce the appearance of acne scarring, and heal the existing acne lesions that have formed under the skin. It is also used by itself as an anti aging and skin rejuvenation tool. Red light therapy also has demonstrated effectiveness in treating rosacea and eczema, so there are multiple applications for this type of infrared therapy. Red light therapy devices can be used as a nonsurgical face lift alternative, as they help your skin maintain elasticity and firmness, while helping refine texture and smooth lines. There are several good hand held LED (light emitting diode) models that you can use in your own home; it’s just a matter of finding the right one. Red light therapy is used in conjunction with invisible Infrared light for skin rejuvenation and more. And when this type of LIGHTWAVE therapy is used for acne scar reduction, it’s combined with Blue light therapy (which can also be used to activate photodynamic therapy, or phototherapy).